Yogi Adityanath is visiting the millennium city to review security and other arrangements ahead of Prime Minister Narendra Modi's visit To Noida on December 25 to inaugurate the Noida-Kalkaji Metro line. 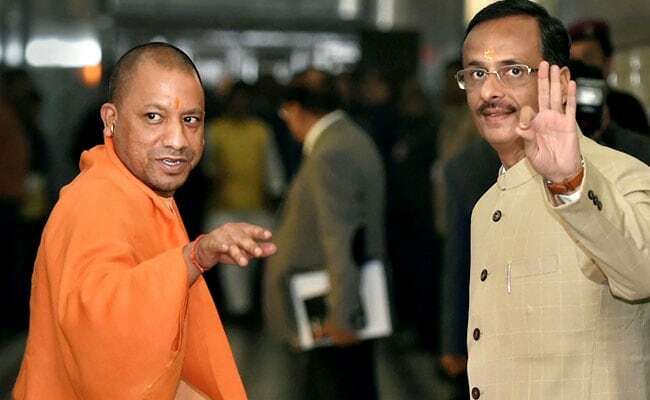 Yogi Adityanath, Uttar Pradesh's 45-year-old Chief Minister, reached Noida on Saturday evening, breaking the famous Noida 'jinx', which has scared away his predecessors from visiting the state's urban hub as it is widely believed that whoever visits Noida, loses power. The chief minister would also hold meetings with district officials and seek details of the progress of development works in the city. Around 1,300 police and paramilitary personnel have been deployed for Yogi Adityanath's security during his visit. Over 5,000 police and paramilitary personnel would be deployed for Modi's visit on Monday. Though Noida or Gautam Budh Nagar district was developed from a cluster of small villages into the prime economic zone of the state, it has been avoided by past chief ministers. Ms Mayawati was the only chief minister to have gone to Noida in 2011 to inaugurate a Rs 685-crore memorial park. Next, she lost in the state elections. However, her successor Akhilesh Yadav, otherwise considered gen next politician, gave in to the decade-old superstition. Mr Yadav didn't visit Noida even once, but still lost in this year's elections that swept the BJP to power with a landslide win. The superstition dates back to the late '80s. ND Tiwari and Veer Bahadur Singh were voted out within a month of their entering Noida. It is why Mulayam Singh, then Chief Minister, refused to visit the area in 2006 when it was reeling from the discovery of the bones and skulls of little children discovered in a drain in Nithari. In 2002, Rajnath Singh, as Chief Minister, inaugurated a flyover linking Noida and Delhi - but ensured that he stayed on Delhi's side of the border. Akhilesh Yadav, who was determined not to repeat Ms Mayawati's mistake, had even skipped two mega events in the town including the foundation stone of a Delhi-Meerut Expressway that was attended by PM Narendra Modi. Mr Yadav, asked why he avoided travelling to Noida, had promised to make the visit after his re-election in the assembly election. Akhilesh Yadav Skips PM Modi's Event At Noida; 'Jinx' At Play?